For other uses, see Kid Galahad (disambiguation). 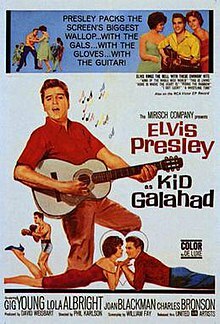 Kid Galahad is a 1962 American musical film starring Elvis Presley as a boxer. It was released by United Artists. The film opened at #9 at the box office when released in the United States in August 1962. Variety ranked it #37 on the list of the top-grossing films of 1962. Kid Galahad was shot on location in Idyllwild, California. Its supporting cast included Gig Young, Lola Albright and Charles Bronson. Some critics rate it as one of Elvis Presley's best performances. The film is a remake of the 1937 original version starring Edward G. Robinson, Bette Davis, and Humphrey Bogart and directed by Michael Curtiz, who also directed the Presley 1958 film King Creole. Willy Grogan is a small-time boxing promoter based in the Catskills resort region of Cream Valley, New York. He owns the Grogan's Gaelic Gardens inn. He is a contemptible man and is in debt and pays little attention to the woman who loves him, Dolly, a chain-smoking, love-starved woman residing at the camp. Into their midst comes Walter Gulick, a young man recently discharged from the Army who loves the peaceful setting almost as much as he loves working on old cars. Walter's simple goal is to go into business as a mechanic at a nearby garage. Willy's younger sister, Rose, shows up unexpectedly. She and Walter immediately hit it off. The obsessively protective Willy doesn't want his kid sister falling for some "grease monkey" mechanic and two-bit boxer. Dolly is envious of the young couple's romance and resents Willy's interference. One day, Walter, in need of work, accepts an offer of five dollars to be a sparring partner and decks one of Willy's top fighters. Willy is persuaded to let this "Galahad" take a shot in a legitimate ring. Both men are reluctant, but each has a need for the money. Walter begins working out under the watchful eye of Willy's top trainer, Lew. After several successes in the ring, Walter is readied for his biggest fight. Gangsters want him to take a dive so that Willy can pay off his debts to them, but "Galahad" throws his muscle behind Willy and emerges victorious. He wins the big fight against Ramon "Sugar Boy" Romero as well as Willy's approval, retiring undefeated to his vintage car and his new love. For this role Presley was tutored in the arts of pugilism by former world junior welterweight champ Mushy Callahan, who appeared in the film as a referee. Callahan actually had a three-decade career as a professional boxing referee after retiring from the ring as a fighter. According to Callahan, in a December 1962 Associated Press news story, in all the close-up scenes when Presley is being struck in the face by punches, it is Callahan who was throwing them. He taught Presley how to move his head backwards as the punches were being delivered so that each blow either missed him or barely touched him. The story further said that Callahan considered Presley to be an excellent athlete. Reigning welterweight champion Orlando De La Fuente also appeared as Ramon "Sugar Boy" Romero. Shooting began in early November 1961 in Hidden Lodge, Idyllwild, California, before a storm forced a move to Hollywood. Of the people who starred in this film, Gig Young made a dramatic appearance while doing other roles: later he won an Academy Award for Best Supporting Actor in the 1969 film They Shoot Horses, Don't They?. Bosley Crowther of The New York Times suggested that Presley was miscast as a boxer, writing that he was "certainly no model for a statue of Hercules, and his skill at projecting an illusion of ferocity is of very low degree." Nevertheless, he found the film to be "moderately genial entertainment. It's not explosive, but it has the cheerful top of a lightly romantic contrivance that ranges between comedy and spoof. For this we can thank the other actors who played their roles ardently and Phil Karlson, who has directed at a brisk and deceptive pace." Harrison's Reports graded the film as "Good" and echoed Crowther's review in writing that "Presley is surrounded by some very nice people. In lending him support, they give strength to a run-of-the-mill story that plays itself out with a simplicity of appeal and bountiful residue of entertainment. The film manages to give a pleasing account of itself." A less positive notice in Variety read, ""The story may be old, the direction not especially perceptive, the performances in several cases pretty poor, but United Artists' 'Kid Galahad' is apt to be a moneymaker in spite of all this." John L. Scott in the Los Angeles Times called the story "old hat" but thought it "should more than satisfy the horde of Presley fans." The Monthly Film Bulletin wrote, ""If the wit and intelligence lavished on the excellent dialogue had also been used to give a shred of ingenuity to the plot or a momentary sparkle to the lyrics, this would have been a much more amusing comedy ... Elvis Presley repeats the amiable oaf performance he gave recently in Follow That Dream, but it is nowhere near as funny, partly because his farcical opportunities are fewer, but mainly because it is hard to laugh continually at someone whose face is seen a couple of times bruised and bleeding in the ring." ^ "Kid Galahad - Details". AFI Catalog of Feature Films. Retrieved July 25, 2018. ^ Crowther, Bosley (March 7, 1963). "Screen: A Ferocious Elvis Presley". The New York Times: 8. ^ "Film review: Kid Galahad". Harrison's Reports: 115. July 28, 1962. ^ "Kid Galahad". Variety: 6. June 25, 1962. ^ Scott, John L. (August 31, 1962). "Presley Plays Boxing Hero in 'Kid Galahad'". Los Angeles Times: Part IV, p. 9. ^ "Kid Galahad". The Monthly Film Bulletin: 155. November 1962. This page was last edited on 3 March 2019, at 05:31 (UTC).